I grew up in Franklin, Tennessee, a small farming town in the outskirts of Nashville, where I began my training under the direction of the late Walter Bunn Gray. I attended the Atlanta College of Art for one year under scholarship and then went on to Pratt Institute in NY for a certificate in graphic design. I later attained my undergraduate degree in Art History from Fordham University in NYC. In 2006, I took an intensive three month wood working course in Rockport Maine at the Center for Furniture Craftsmanship. A contemporary abstractionist in painting and sculpture, I am fascinated with objects such as coins, obsolete stock certificates, keys and old bank checks from which I create foundations for my mixed media paintings. Wood is my starting point for my sculpture that are later cast in limited edition bronzes. My work can be found in public and private collections throughout the states and Europe, as well as museum collections such as the Telfair Museum's, Jepson Center for Contemporary Art in Savannah Georgia. 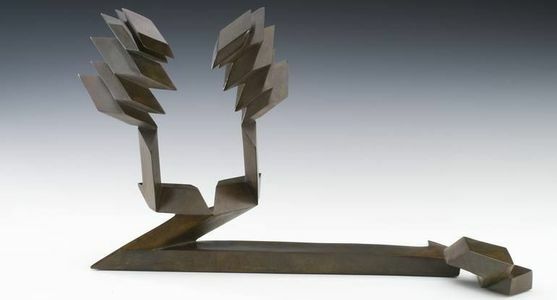 The US Court of Appeals in Atlanta Georgia acquired two bronze sculpture in August of 2018 for permanent display in the lobby. Private Study with Walter Bunn Gray, Franklin, TN, Atlanta College of Art, Atlanta, GA, Pratt, NY, Fordham University, Lincoln Center, NYC and Center of Furniture Craftsmanship, Rockport Maine. "A 39 Year Retrospective - Part II" Cumberland Gallery located in Nashville, Tennessee opening Februrary 9th 2019 and it will run until March 2nd. Currently I have paintings and sculptures at the United States Court of Appeals for the Eleventh Cirucuit, Atlanta, Georgia (permanent exhibition). Please see my web site, www.gavinzeigler.com and the above mentioned galleries and museums for additional information.